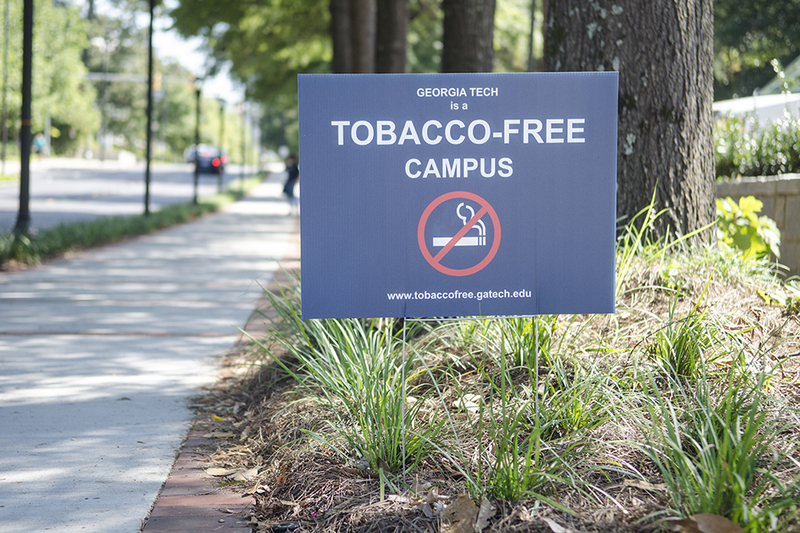 With the implementation of the Tobacco and Smoke Free Campus Policy, Tech’s campus is now supposedly tobacco free as cigarettes, hookah, e-cigarettes, pipes, chewing tobacco, and clove cigarettes are officially banned. The policy, however, sparks controversy, as students remain divided over the ban’s overall execution. Some individuals feel the Tobacco and Smoke Free Policy will not greatly impact their daily life, but they still remain slightly dismayed at the ban’s implications. “I’m a little upset that hookah is banned because I do smoke hookah for social gatherings. But I agree with the fact that you cannot have tobacco on campus for safety purposes. I, ultimately, do not really smoke a lot so it does not really affect me all that much,” said Noah Mohl, a first-year ME major. Others view the policy in a positive light as 30 other University System of Georgia institutions are enacting a similar Tobacco and Smoke Free Campus Policy. Even though smokers can smoke off of Tech’s campus, some non-smokers still notice no difference between the campus pre-tobacco ban and post-tobacco ban. “I do not mind the smoking ban because I do not smoke, but I still see people smoking cigarettes on campus. Ultimately, I feel like it is a rule that not a ton of people follow or even really care about,” Kameron Akbar, a second-year IE major, said. Students also point out that the ban is only redirecting smokers to new, more secluded locations. “I am in favor of the smoking ban because now I can actually breathe. But I do live in the Graduate Living Center on Tenth street, so a lot of students go over there to smoke now, so I do not see the policy being properly implemented,” said Courtney Callahan, a second-year ChemE major. Other students propose new methods to replace the current Tobacco and Smoke Free Campus Policy. “I think they should create smoking zones so people that want to smoke can smoke. Besides, people are going to smoke regardless,” said Wilson Lauerman, a second-year ChemE major. Overall, most students feel the new policy is not being properly enforced on-campus. “I do not think the ban is effective. I personally still see people being in their normal squares smoking outside classroom buildings. The signs are just there and no one reads them or chooses to listen to them,” Hardika Dhir, a second-year BME and PreHealth major said. The Tech administration, however, understands the difficulty of preventing tobacco use on campus, but continues to remain optimistic about the Tobacco and Smoke Free Campus Policy’s eventual impact. Even Stamps Health Services plans to help students who need assistance breaking their tobacco addictions. They plan to ease students and staff members through the difficult transition by offering various services. With the administration and Stamps determined to effectively implement the designated order, the Tobacco and Smoke Free Policy will hopefully be properly executed in the near future, therefore pleasing some Tech students on campus.